Complete the Application Form (at bottom of page) to JOIN or RENEW your Club membership. NOTE: You cannot apply for a Race Licence in Ridernet until we have registered your current club membership with them. Email your Ridernet ID to us (if you haven’t already listed it on your membership application) and we will register you within 24 hours. 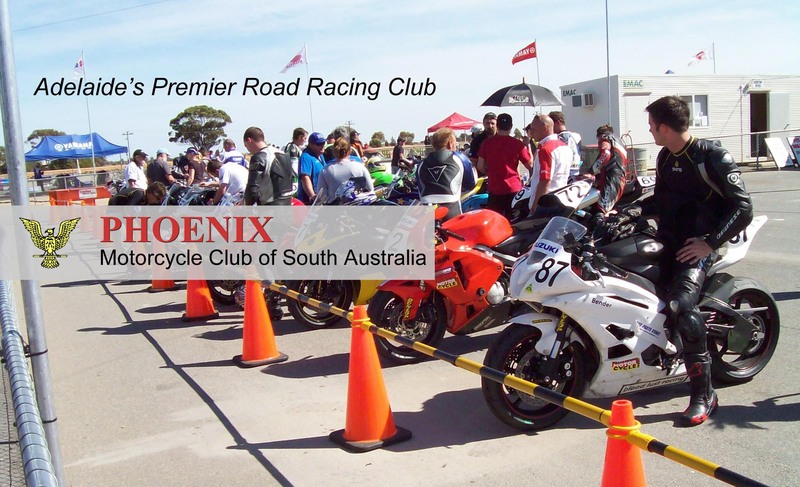 The Phoenix Motorcycle Club of SA was founded in 1964 and is a non profit sporting club affiliated with Motorcycling South Australia. While our members have been involved in many facets of motorcycling over the years, the Club now focuses on Road Racing and is involved at all levels from Juniors to A Grade. To find out what’s happening in the Club, follow us on facebook or come to our monthly meetings. New members and visitors are always welcome. Membership is open to anyone who is interested in motorcycling, whether you want to race, assist with events or just enjoy the social activities. You will be able to vote on items of interest to the club and, as a member of an affiliated club, you have a vote on national matters such as changes to racing rules. Read the Rules in our Club Constitution for details of eligibility and conditions of membership.